The real-money Sky Poker app is only available to players based in the United Kingdom and Republic of Ireland. Play Sit and Go and ring games on any Apple iPhone or iPad device. Watch "Sky Poker TV" live on your phone or tablet. Recent releases of Sky Poker's mobile poker software have included a number of critical bugs that makes it impossible for us to recommend their app any longer. BetOnline now offer the best mobile poker software. Only available in the United Kingdom, Ireland & Finland. Create an account and then play instantly on iPhone. 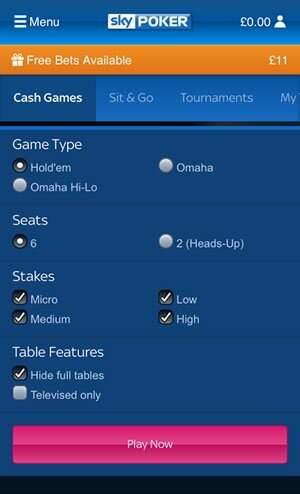 Texas Hold'em and Omaha cash games on mobile. Play Sit and Go poker tournaments on smartphones. Get £10 completely free when you download the app. Watch a live stream of "Sky Poker TV" from the app. With the percentage share of mobile devices used to access the internet rapidly climbing to thirty-three percent and beyond, and with the latest iPhone models having screens closer in size to tablets, more and more of the leading poker rooms are falling over themselves to deliver dedicated apps for mobile poker players. 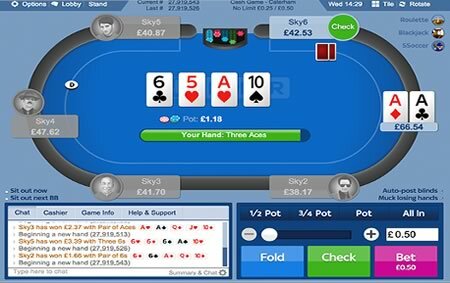 The UK's leading satellite broadcaster, British Sky Broadcasting, are the latest poker provider to jump on the mobile platform bandwagon. 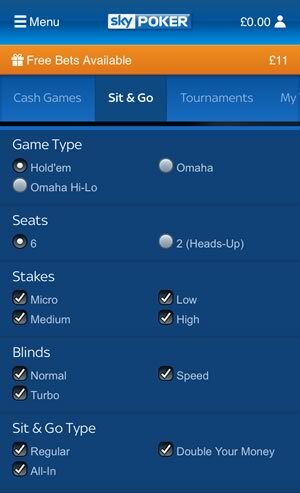 New to iTunes comes the Sky Poker iOS app, suitable for iPhones and iPads and available to UK and Ireland players. Alternatively, you can simply play the HTML5 web app by visiting m.skypoker.com. The Sky Poker app is available as a web-based app worldwide or as an iTunes App Store app if you live in the UK, Ireland, Gibraltar, Finland or the Channel Islands. To play from your phones browser just create an account with SkyPoker and then browse to m.skypoker.com. At 15.7 MB it's a relatively insignificant amount of data to nibble into the iPhone's memory. The app is optimised for the iPhone 5, but will work with any phone using iOS or later. New customers to Sky Poker can take advantage of the poker room's new player deal. This amounts to receiving £10 absolutely free, plus a 200 percent first deposit bonus that maxes out at £500. Naturally, such generosity doesn't come without strings attached. The free tenner is given in tournament tickets for Sky Poker Sit & Go's – 2 x £2.20 tokens and 2 x £3.30 tokens. The deposit bonus is released in £10 increments for every 250 poker points that are earned. Six poker points are earned for every £1 in rake generated playing ring games, and ten poker points are earned for every £1 spent in tournament entry fees for single and multi-table tournaments and Sit & Gos. Players have 30 days from the award of their bonus. 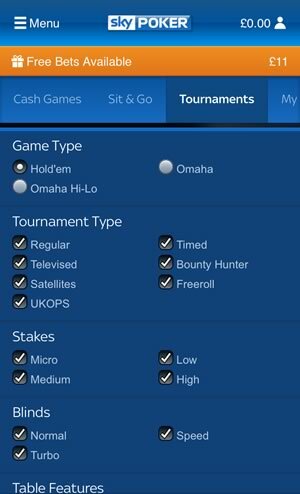 Once you've logged into the app with your Sky Poker username and password, you can choose the type of game you are interested in – either Holdem, Omaha (Hi) or Omaha Hi-Lo playing cash games, Sit & Gos or Tournaments. There are, however, only two types of games available – 6max and HU. It seems extremely odd that a supposedly state-of-the-art poker client can only manage a maximum of six players at a table. You can also set the type of stakes you're interested in playing for (Micro, Low, Medium or High) and filter out full tables as you search for a game. Once you've made your choices you click on the pink “Play Now” button and you're whisked away to a table that meets your choices. If you want to make a more discerning choice of table you can simply pop into the Sky Poker lobby and make your selection from the pool of tables available. Apparently desktop players share their tables with mobile users, which must be a little annoying as mobile users are far more prone to unstable connections. Aside from the game-play, the app also allows you to watch Sky Poker TV, which is Sky's TV channel dedicated to all things poker and is broadcast normally via satellite on Channel Sky Channel 861. You can also manage all aspects of your Sky Poker account from the app, including the state of your bonuses and any other promotions. Sky Poker's inability to provide for tables for more than six players does at least lead to an attractive, uncluttered display. On tablets, player avatars as distributed evenly around a table display, and on smaller iPhone screens the table is dispensed with and replaced with a solid blue background. The cards are nicely rendered and you can switch to a four-colour deck if that makes things easier for you. The all-important action buttons are cramped into the bottom right-hand corner of the screen, and are colour-coded for the three main actions: Fold, Check/Call and Bet. There are simple bet size options for ½ pot, ¾ pot, pot and all-in, and a “tricky to use” slider should none of the default options appeal to you. Game play seems quite reliable and smooth if not particularly speedy, although a few players have complained that sometimes the app likes to keep what your pocket cards consist of to itself, and players are forced to muck unseen cards that turn out to be playable hands. There are also complaints that the app freezes from time to time, and that once you're seated at a table, you can't nip back into the lobby to see if a more suitable table has become available without quitting your current table altogether. One bizarre bonus of playing at Sky Poker's tables is that you may suddenly find your table being broadcast and commentated upon on Sky Poker TV. A lot of poker experts have commented on the poor standard of players at Sky Poker – particularly between noon and 2pm in the UK, which is the traditional time for lunch. Lots of hopeless bluffing, straight-chasing and seeing the flop with hopeless pocket cards has been observed. One theory behind all this loose play is that Sky Bet customers use Sky Poker to keep themselves busy before the latest race has come under starters orders. At times there is also a paucity of players, meaning Sit & Go fans at certain pot limits (and Omaha fans at all disciplines) have to wait a long time before their table fills up. The main concern with the app seems to be the frequency at which the app freezes or fails to flip over pocket cards once they are dealt, which is unforgivable. Anyone who loses out on a sizeable pot because they were forced to fold “invisible” pocket aces is likely to find themselves severely out of pocket after throwing their iPhone or iPad across the room in anger. The inclusion of Sky Poker TV seems something of an unnecessary novelty, although the chance to see your avatar on live TV and your poker playing praised or condemned by a poker expert does have something of an attraction. Sky have already announced that the next version (version 5) of their app will include a few bug fixes and (hopefully) multi-tabling. While there is nothing overtly wrong with the Sky Poker iPhone app as it stands, if you take your mobile poker playing seriously, then perhaps it may be best to wait until the next version of this app appears for download in iTunes.